The Royal Hand Puppets set is ideal for creative kids who love pretend play and telling stories! 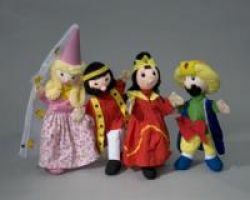 With a royal King, majestic Queen, dainty Princess, and magical Genie, these puppets could be characters in thousands of imaginative stories; or act out some of your favorite fairy tales. Put this set together with the Fairy Tale Hand Puppets set for even more dramatic possibilities!